[PDF] Handbook of the Behavioral Neurobiology of Serotonin, Volume 21 (Handbook of Behavioral Neuroscience) | Free eBooks Download - EBOOKEE! Posted on 2018-01-11, by luongquocchinh. Description: Serotonin (5-hydroxytryptamine, often cited as 5-HT) is one of the major excitatory neurotransmitter, and the serotonergic system is one of the best studied and understood transmitter systems. It is crucially involved in the organization of virtually all behaviours and in the regulation of emotion and mood. Alterations in the serotonergic system, induced by e.g. learning or pathological processes, underlie behavioural plasticity and changes in mood, which can finally results in abnormal behaviour and psychiatric conditions. Not surprisingly, the serotonergic system and its functional components appear to be targets for a multitude of pharmacological treatments - examples of very successful drugs targeting the serotoninergic system include Prozac and Zoloft. The last decades of research have not only fundamentally expanded our view on serotonin but also revealed in much more detail an astonishing complexity of this system, which comprises a multitude of receptors and signalling pathways. A detailed view on its role in basal, but also complex, behaviours emerged, and, was presented in a number of single review articles. Although much is known now, the serotonergic system is still a fast growing field of research contributing to our present understanding of the brains function during normal and disturbed behaviour. 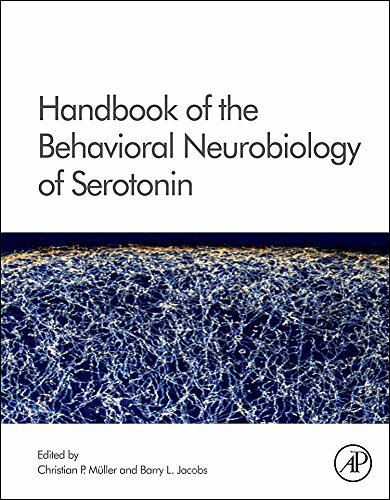 This handbook aims towards a detailed and comprehensive overview over the many facets of behavioural serotonin research. As such, it will provide the most up to date and thorough reading concerning the serotonergic systems control of behaviour and mood in animals and humans. The goal is to create a systematic overview and first hand reference that can be used by students and scholars alike in the fields of genetics, anatomy, pharmacology, physiology, behavioural neuroscience, pathology, and psychiatry. The chapters in this book will be written by leading scientists in this field. Most of them have already written excellent reviews in their field of expertise. The book is divided in 4 sections. After an historical introduction, illustrating the growth of ideas about serotonin function in behaviour of the last forty years, section A will focus on the functional anatomy of the serotonergic system. Section B provides a review of the neurophysiology of the serotonergic system and its single components. In section C the involvement of serotonin in behavioural organization will be discussed in great detail, while section D deals with the role of serotonin in behavioural pathologies and psychiatric disorders. The first handbook broadly discussing the behavioral neurobiology of the serotonorgic transmitter system Co-edited by one of the pioneers and opinion leaders of the past decades, Barry Jacobs (Princeton), with an international list (10 countries) of highly regarded contributors providing over 50 chapters, and including the leaders in the field in number of articles and citations: K. P. Lesch, T. Sharp, A. Caspi, P. Blier, G.K. Aghajanian, E. C. Azmitia, and others The only integrated and complete resource on the market containing the best information integrating international research, providing a global perspective to an international community. No comments for "[PDF] Handbook of the Behavioral Neurobiology of Serotonin, Volume 21 (Handbook of Behavioral Neuroscience)".